Two new instruments will give the Large Binocular Telescope a set of sharper eyes capable of studying planets outside our solar system in greater detail. A pair of new-generation instruments to be mounted on the world's largest optical telescope, the Large Binocular Telescope, or LBT, located on top of Mount Graham in Arizona, will turn the telescope into a formidable hunter of extrasolar planets. Named SHARK (short for System for coronagraphy with High order Adaptive optics from R to K band), the instruments will enable astronomers to obtain direct images of exoplanets, including very faint ones, by more effectively blocking the otherwise overpowering light from their host stars. INAF, the Italian National Institute for Astrophysics, is leading the international consortium that will build the instruments and will also manage their scientific use. SHARK recently has received the official green light from the LBT board, and the two instruments are expected to become fully operational by the end of 2019. SHARK consists of a pair of instruments working synergistically in visible light (SHARK-VIS) and in the near infrared (SHARK-NIR). 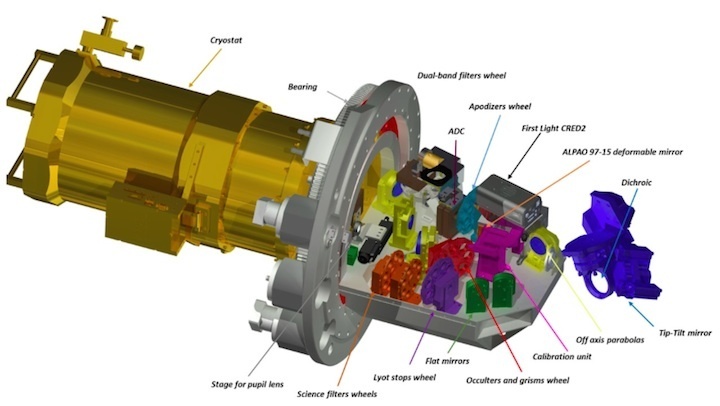 These will be operated in parallel, taking advantage of the two big 8.4-meter mirrors of the LBT, thus making it the first telescope in the world capable of observing exoplanets simultaneously over such a wide range of wavelengths. The main problem exoplanet hunters face when studying exoplanets is the extreme contrast between the planets' faintness in comparison to their host stars' light, explains Christian Veillet, director of the Large Binocular Telescope, which is managed by the University of Arizona. To be able to study candidates for potentially Earth-like planets, for example, astronomers need more sophisticated instruments to tease out the signal from the noise. The "SHARKs" will take full advantage of the outstanding adaptive optics system mounted on the LBT, which was also developed by INAF. This system corrects in real time the image distortions induced by the atmospheric turbulence to deliver final frames that are characterized by a sharpness and quality of detail better than those obtainable with the Hubble Space Telescope. "LBT’s Adaptive Optics is currently undergoing a makeover offering even better performance, which will be fully utilized by SHARK to bring the LBT to the forefront of what is possible in this arena," Veillet says. "We are preparing the path to doing unprecedented science on the next generation of telescopes, such as the Giant Magellan Telescope, an LBT on steroids with seven 8.4-meter mirrors on the same mount instead of two." "With this great combination, we will finally be able to reveal many exoplanets around stars in our galactic neighborhood and better characterize their properties, by also using images in optical light taken for the first time in the northern hemisphere," adds Fernando Pedichini of the INAF-Osservatorio Astronomico di Roma and principal investigator of SHARK-VIS. With SHARK, it will be possible to directly image gaseous giants in the outer regions of exoplanetary systems, thus obtaining pieces of information about the architecture of such systems that are complementary to those provided by techniques purely focused on detection. Such techniques include observing the gravitational tug unseen planets exert on their host star, or the minuscule dip in a star's brightness when a planet passes in front of it. "These observations are key to understanding the formation mechanisms of planetary systems," says Simone Antoniucci of the INAF-Osservatorio Astronomico di Roma, instrument scientist of SHARK-VIS. "Moreover, one of the unique features of SHARK will be the capability to directly observe the formation process of giant planets around very young stars." 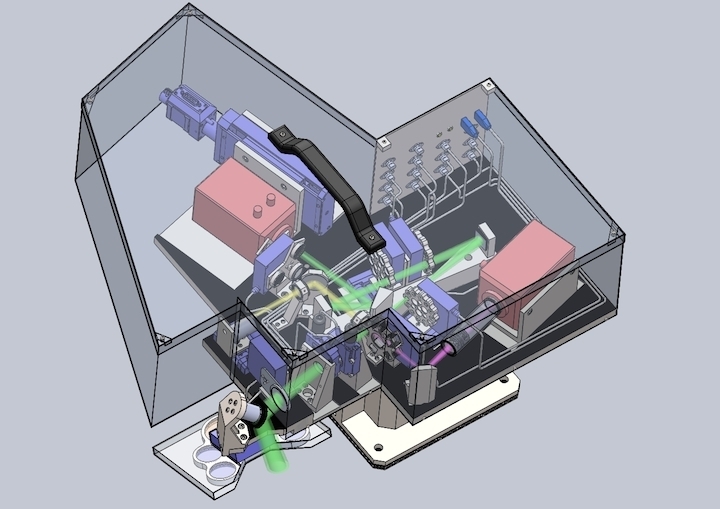 "Thanks to the outstanding sensitivity of the LBT adaptive optics system, SHARK-NIR, used in parallel with SHARK-VIS and the LBTI LMIRCAM instrument, will allow us to study not only exoplanets, but also astrophysical phenomena," says Jacopo Farinato, astronomer at the INAF-Osservatorio Astronomico di Padova and principal investigator of SHARK-NIR. "For instance, we will be able to study with formidable accuracy disks and jets of young stars, gas envelopes around evolved stars, asteroids and minor bodies of the solar system and even the brightest extragalactic sources such as active galactic nuclei." "While these two SHARKs are built as instruments to be operated by the teams who built them, they will be open to the whole LBT community," Veillet adds. "Both teams have garnered an impressive scientific collaboration, covering the wide range of potential scientific programs as well as the diverse partnership on which LBT is built." Each SHARK will be installed on one side of the LBT Interferometer (LBTI), the green structure seen in the middle of the picture between the two main mirrors of LBT. The SHARK consortium is led by INAF, and the partners for the NIR channel are the Steward Observatory in Tucson (University of Arizona), the Max Planck institute of Heidelberg (Germany) and the Institut de Planétologie et d’Astrophysique of Grenoble. The Italian institutes involved in the instrument construction are the Observatories of Padova, Roma, Arcetri, Milano, Trieste and the Physics and Astronomy department of the University of Padova. The Large Binocular Telescope (LBT) is an international collaboration of the University of Arizona, Italy's National Institute for Astrophysics (INAF), Germany's LBT Beteiligungsgesellschaft, The Ohio State University, the Tucson–based Research Corporation representing the University of Minnesota, the University of Virginia, and the University of Notre Dame. INAF contributes 25 percent of the LBT costs (construction and management) and owns one fourth of the telescope and of the same share of observing time.